Joey and Cooper at the Novo Nordisk sponsored Mallard’s game. 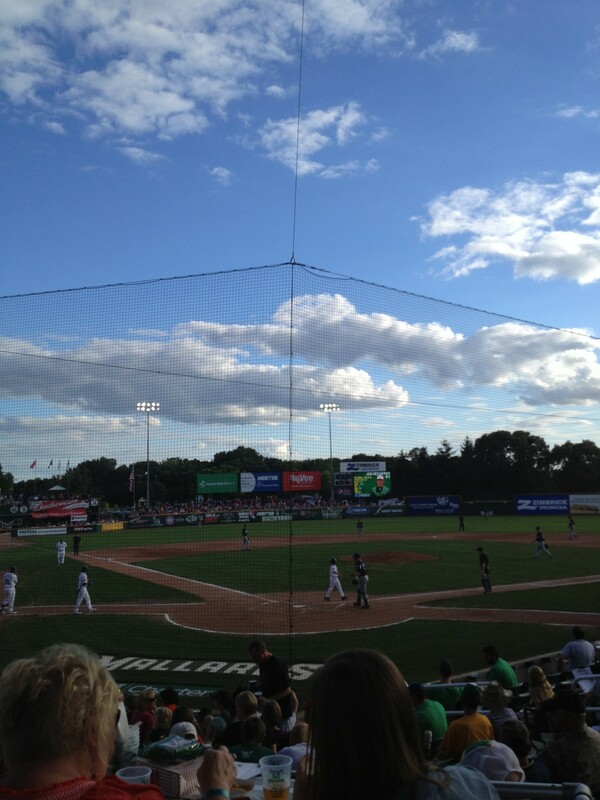 Our family was treated to a wonderful day at the Madison Mallard’s baseball game. The day was sponsored by Novo Nordisk, they make NovoLog insulin. They provided free tickets to the game, a tailgate with food, drinks, gift bags for all, including a new Mallard’s baseball cap. Since Novo Nordisk offered the American Diabetes Association tickets for the game, the ADA took the opportunity to host a Family Link event. A lot of families from around the state were there. For me it’s nice to put a face to someone that I have been emailing with, or in a Type 1 diabetes group on facebook. Joey had some unique opportunities while at the game. 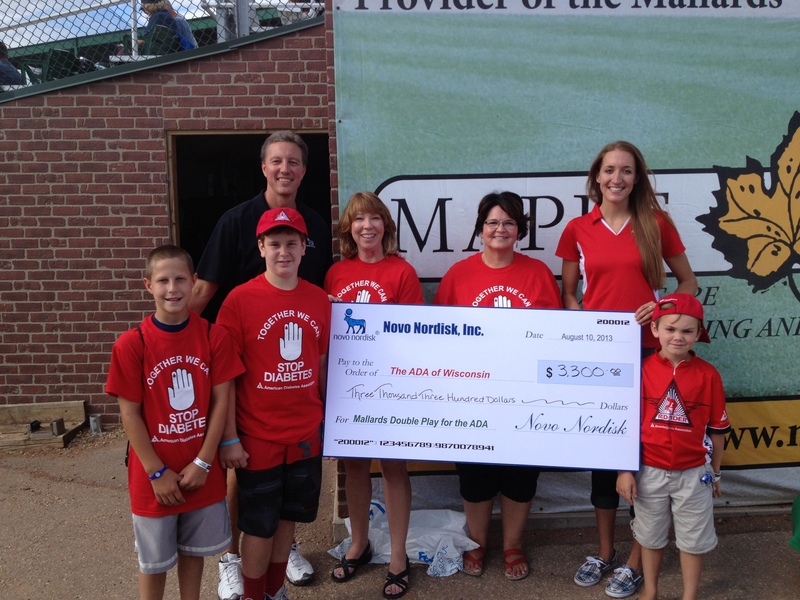 As the Ambassador for the ADA, he was invited to go out on the mound and accept a check from Novo Nordisk to the ADA. The check represented the number of double plays that the Mallard team made over the course of the season. When Sue from the ADA filled in the amount on the check, it represented 33 double plays at $100.00 per so an astonishing $3,300! Awesome! The 7500 seat ballpark is reminiscent of days gone by, you feel like you’ve stepped back in time, even though in 2011 the park was newly renovated. The new grandstand has seats that were once at Oriole Park in Baltimore. Maybe that’s why it has such a nostalgic feel to it. This Mallard’s team brings in over 6700 fans per game. They bring in more fans than most other teams in the Northwoods league. The players are college players from across the country. The fans, both kids and adults alike are so excited when a player walks by and eagerly stops to sign an autograph for them. The mascot walks around, poising for pictures. It’s such a fun, exciting atmosphere. 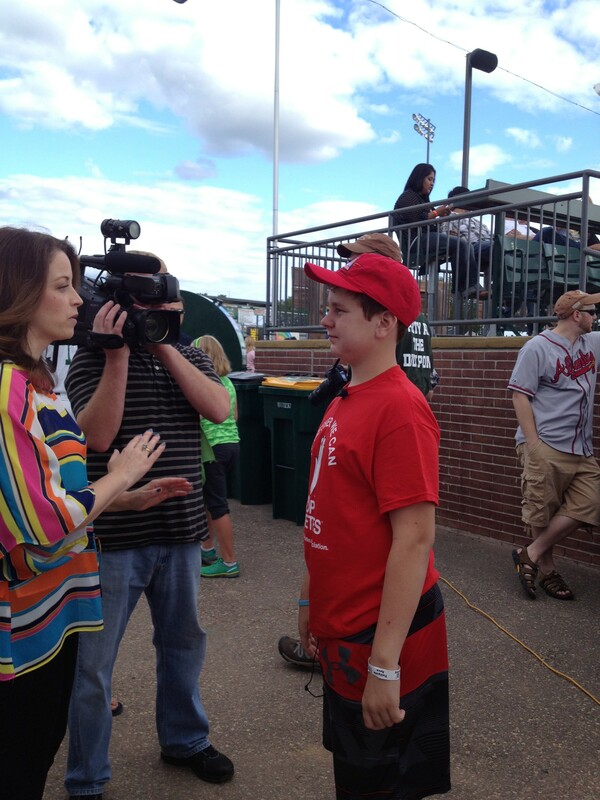 Joey had several interviews scheduled at the Mallard’s game. Veronica from ABC was interested in Joey and Jake’s story, and what it’s like playing football with type 1 diabetes. Melissa from Fox asked what it’s like to live with Type 1 everyday. Both very good interviews with a different agenda. 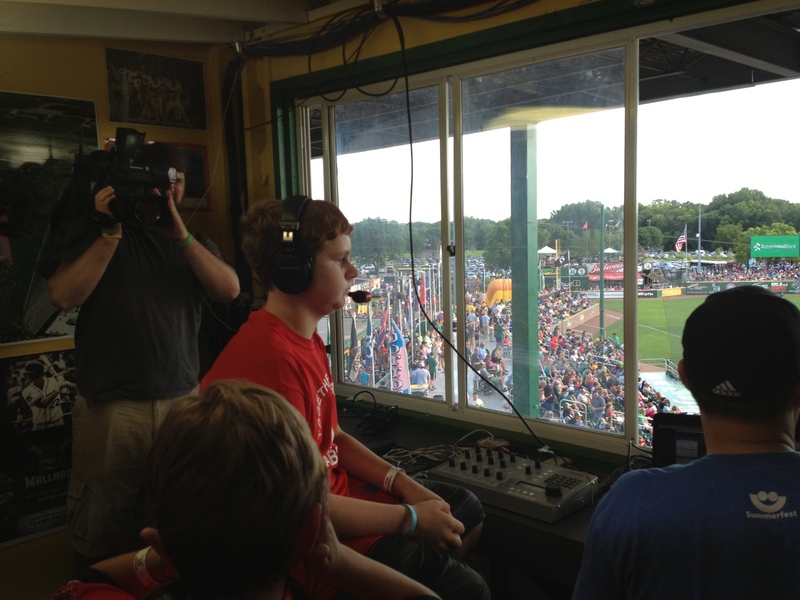 I think Joey was the most nervous about being interviewed in the ESPN Press Box. Being on the radio is different from being in front of the camera. He did a great job regardless of his nervousness. 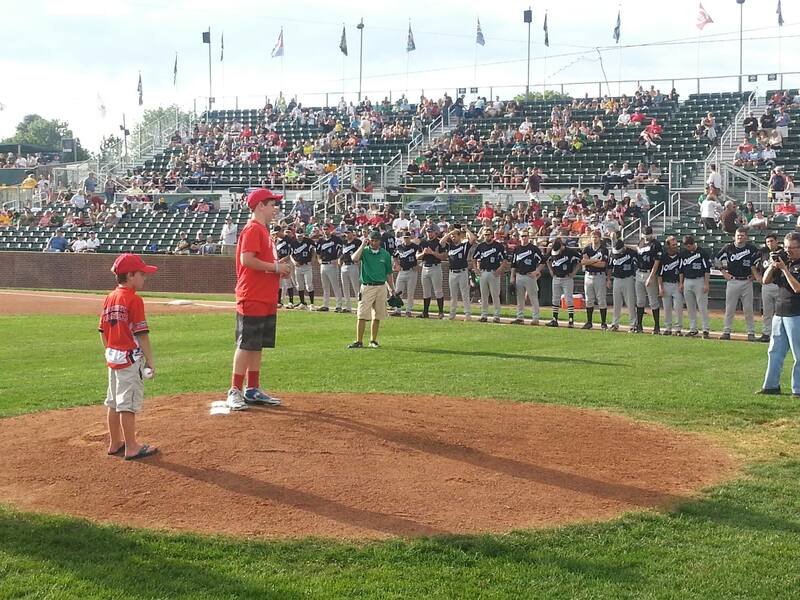 Joey throwing out first pitch. Joey was so excited when he learned that he would be the one to throw out the first pitch at the game. He and his nephew Cooper got up on the mound and each took a turn at throwing the ball over the home plate to the catcher. All the cheers had to be deafening. He added his baseball to his other prized possessions in his room. We were given two choices of insulin when Joey was diagnosed, we didn’t know the differences of the two, so we just picked, unfortunately we didn’t choose NovoLog, however, we have since made the decision to change to it. We decided to change because this past summer has been a real eye opener. We first saw Gail S. in Madison at Diabetes Day at the Capitol. Gail is an employee for Novo Nordisk, and an acquaintance of mine. Her daughter and my son attend the same high school. She was there like we were, trying to convince law makers to keep diabetes issues at the forefront of their funding for a cure. Diabetes care is very expensive and we’re are all affected by the high cost of it. 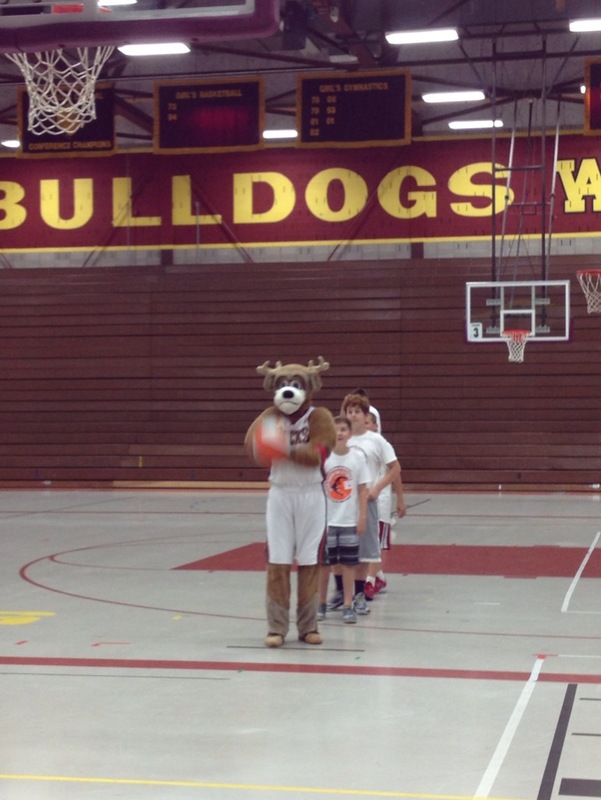 Joey and Bango the Buck, at the Slam Dunk for Diabetes Cure Basketball Camp. As we picked up Joey from the ADA Diabetes Camp in June, we met another representative for Novo, this time giving away Land’s End backpacks filled with information and other tools that we could use in our back to school preparation. I had heard of the Slam Dunk for a Cure basketball camp, but it was only available in Chicago. They have been talking about expanding to other cities, but they need the funds to do so. When Novo found out that there was someone here in WI willing to do a lot of the leg work, thank you Jodi Borck, they said “let’s do it.” So because Novo Nordisk sponsored the camp, Joey was able to attend his first ever basketball camp for kids with diabetes. It’s a blessing. As a parent when you walk into summer camp, or basketball camp and the kids all have type 1 diabetes, it’s overwhelming. The great thing for the kids is they see that they aren’t the alone. It’s fantastic. And now this wonderful, fun event where Joey made so many memories!! Novo sponsored this event for approximately 250 families. At a time when families find it hard to spend extra money on entertainment, it was a blessing for so many! We feel that Novo Nordisk has proven that they are dedicated to finding a cure for type 1 diabetes, therefore, we are going to support them like they support us. 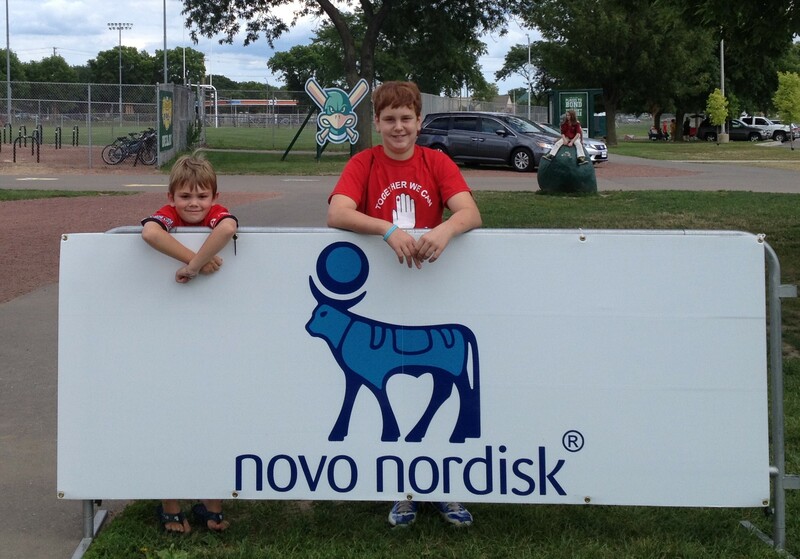 Thanks Mitch for a very fun day, and all that Novo Nordisk does for families with type 1 and type 2 diabetes. !